Hit F5 in VSCode and make sure that everything is still working by invoking the function with some query parameter and checking that the value appears in the local storage emulator. We can go the azure portal to see the new Function App. One important thing to notice is that the code is now read-only in the portal, with a good explanation on why this is the case. So there is no mixing and matching between editing in the Azure portal and editing on an IDE. Good to know. Works! And with the storage explorer we can confirm that the function is using the right storage and writing to it. 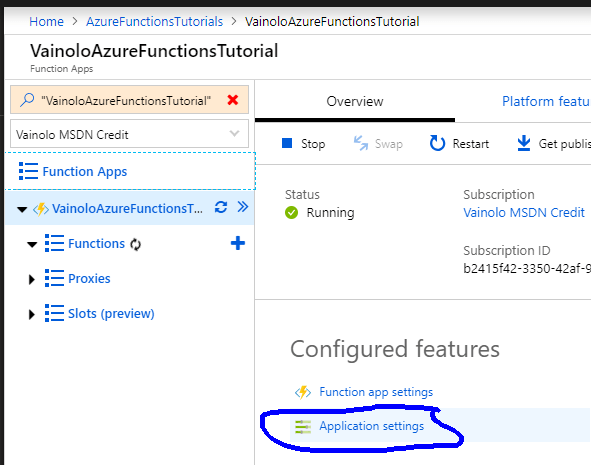 Now that we have a local environment ready that is also easy to deploy, we can start investigating all the functionality that is available in Azure Functions. Until then, happy coding!